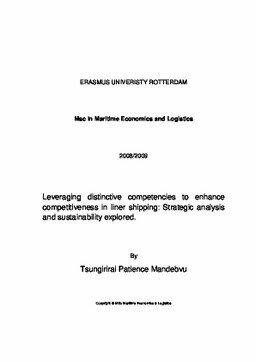 Erasmus University Thesis Repository: Leveraging distinctive competencies to enhance competitiveness in liner shipping: Strategic analysis and sustainability explored. Leveraging distinctive competencies to enhance competitiveness in liner shipping: Strategic analysis and sustainability explored. The current recession has adversely affected every operator within the transportation value chain. However, in times of crisis there lie opportunities which carriers can restrategize and reposition themselves better within the industry. This thesis attempts to explore how carriers can utilize their distinctive competencies, to give them a competitive advantage over competitors within the transportation value chain. For the purpose of this thesis, the following are all strategic tools at the disposal of a liner shipping company: the resource based views, leverage theory, cross-subsidization, bundling, tying, vertical integration and global network economies.